Buccaneers-Panthers AfterMath: A fake punt? 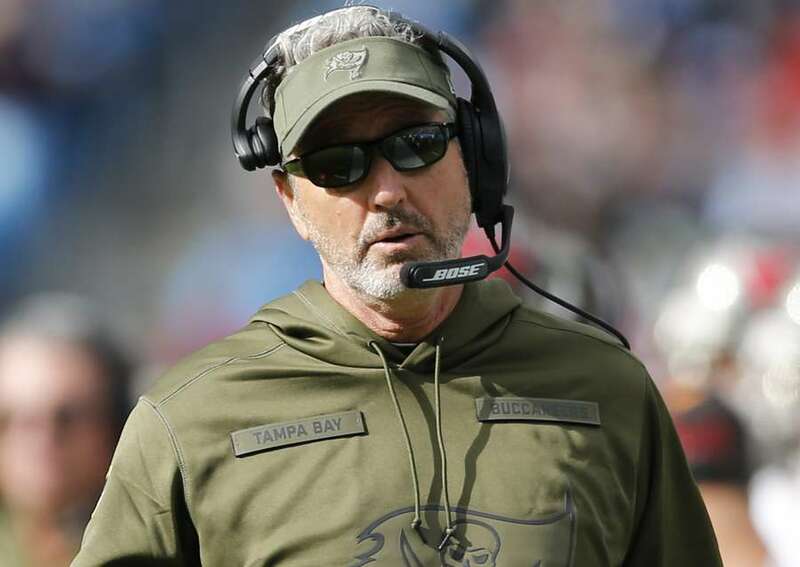 What the … Is Dirk Koetter trying to fire himself? Who’s the quarterback in Tampa Bay? Is it Jameis Winston? Is it Ryan Fitzpatrick? How about Bryan Anger? Let’s talk about Koetter’s decision to put the ball in the punter’s hands on fourth and 9. I was in a bookstore this weekend and saw that Michael Lewis, one of my favorite authors, had written a new book, The Fifth Risk. I pulled a copy from the stack and started reading the inside flap. We’re eight games into the Buccaneers 2018 season. The blinding euphoria from the early-season wins over the Saints and Eagles has faded. The Bucs have shown us what they truly are: a mess. A hot, stinking mess. Sunday’s 42-28 loss to the Panthers was more than a game. It was a thesis statement. In the simplest, plainest terms, Tampa Bay spent 60 minutes proving that this rebuild, which unofficially started with the selection of Jameis Winston in 2015, isn’t working. • Exhibit A: Ryan Fitzpatrick’s ugly first-quarter interception. Even though he had two wide open options underneath, he chucked it deep to the wide open guy wearing a black jersey. Ryan Fitzpatrick is Jameis Winston and Jameis Winston is Ryan Fitzpatrick. • Exhibit B: Christian McCaffrey’s 32-yard catch and run 10 minutes into the game. • Exhibit C: D.J. Moore’s 32-yard run on the very next play. • Exhibit D: Curtis Samuel’s double-reverse touchdown. The box score says it was a 33-yard run, but Samuel didn’t run in a straight line. He went full Tecmo Bo Jackson, running from sideline to sideline on his way to the end zone. He actually traveled 104 yards, according to ESPN Stats & Information. Not that he needed the help, but the Bucs were gracious enough to assist. • Exhibit E: A second 30-plus-yard gain for McCaffrey — this time on a routine handoff. No fancy misdirection and double reverses necessary. • Exhibit F: The Failed Fake Punt. Whew. Let’s unpack that decision. In short, going for it on fourth and 9 from your own 26-yard line doesn’t make much sense. Even if you’re losing 28-7 in the second quarter. In the fourth quarter? Of course. But in the second? It seems desperate. Look, I love it when coaches go for it on fourth down. Love it. Like Dorothy Boyd loves Jerry Maguire. I get misty-eyed whenever I see it. But even I have limits. There are reasons why there are so few examples of coaches passing in this situation. One, obviously, is that professional football teams usually don’t find themselves losing 28-7 halfway through the second quarter. Another is that coaches tend to be ultraconservative. In the past decade, I could find only one comparable scenario. In December 2016, the Rams attempted a pass out of a punt formation on fourth and 9 from their own 30. It didn’t work, and they went on to lose to the Seahawks 24-3. If you recall, that Rams team also was a hot mess. They were 4-9 and had just fired Jeff Fisher. They had, by far, the league’s worst offense. They really didn’t know what to do. They were throwing darts in the dark. Fourth and 9s are difficult to convert, and in general teams shouldn’t attempt them, according to New York Times data. There’s one sliver on the field where it might make sense: from an opponent’s 38-yard line. Anything closer, and a field goal is the play. Anything farther, and a punt is the play. Consider, too, that the Bucs made long odds even longer. Koetter didn’t leave his offense on the field. He put the ball in the hands of Bryan Anger, a punter who hadn’t thrown a pass in a game since 2014. A couple of questions: 1.) Is Koetter trying to get himself fired? I’d want out, too, but jeez. 2.) Coaches and their staffs scout their opponents and themselves, at least I assume so. Surely, the Bucs knew before this game that they had a historically bad defense and that the Panthers offense was playing at a high level, arguably even higher than during their Super Bowl run in 2015. Don’t you know heading into the game that you’re going to need to steal a possession? Why wait until you’re down 28-7? At that point, there’s a 97 percent chance the game is over. In the light of today, it’s clear that part of what Koetter said was true, that the Bucs were going to need to steal a possession. It’s the timing that’s difficult to understand. He had a much more favorable opportunity earlier in the game. Halfway through the first quarter, they had a fourth and 2 from their own 43. They punted. That’s the time to go for it. And the math backs it up. In that situation, teams should go for it everywhere beyond their 28-yard line, the New York Times’ data show. Koetter’s not dumb. He knows the math on fourth and short. He’s just afraid to trust it. He’s worried that he’ll get fired. “The percentages say you should go for it almost every time,” Koetter said in September. “We’ve studied the analytics on it, and the problem with looking at it like that — those are all looking at all fourth downs over the course of the season. You might get three in a row, but if I don’t get it in this particular game, we might be losing, and I might be out of here." Yes, the Panthers had only a seven-point lead at the time, but again you should know heading into the game that you need to take seize every possible hidden advantage. Fourth and 2 is an opportunity; fourth and 9 is not. By going for it on fourth and 9 but not fourth and 2, Koetter didn’t help his team, or himself. He just made his life messier. • Another game, another rally, another letdown. In his career, Fitzpatrick has thrown 52 touchdown passes when leading, 32 when tied and 106 when trailing. Winston has similar splits. He has thrown 16 touchdown passes when trailing, 10 when tied and 49 when trailing. You can interpret these statistics any number of ways. You could argue that both quarterbacks haven’t had good careers. You could argue that both quarterbacks played on teams with bad defenses. You could argue that both quarterbacks have thrown most of their touchdowns in garbage time. You could argue that they’re the same quarterback. • DeSean Jackson, one of Fitzpatrick’s favorite early-season targets, didn’t see a pass in his direction until after the two-minute warning in the second quarter. By then Tampa Bay was losing by 28 points. The Bucs say they’re not phasing Jackson out of the offense, but he played less than half of the snaps for the second time in three games. • Tampa Bay took some heat when it drafted tight end O.J. 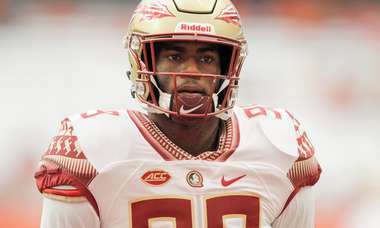 Howard over running back Dalvin Cook in the first round of the 2017 draft. It was absolutely the right call. Howard, who caught two touchdown passes Sunday, is on pace to score 10 this season. He would be the fourth tight end in NFL history to score double-digit touchdowns in his second season, joining Antonio Gates (2004), Jimmy Graham (2011) and Rob Gronkowski (2011). If you had to name one untouchable player on the roster, it might be Howard. • So the bad defense wasn’t entirely former coordinator Mike Smith’s fault. The interception drought is at 24 straight quarters. • Here comes Adrian Peterson. The 33-year-old running back has rushed for more than 600 yards this season for Washington. Last time we saw Peterson he was running roughshod over the Bucs defense (134 yards and two touchdowns) in a 38-33 Cardinals win. That the Panthers would capitalize on their speed and explosiveness and misdirection the Bucs to death. Three players had gains of at least 30 yards — McCaffrey (twice), Moore and Samuel. I expected Jackson to be more of a factor with Fitzpatrick starting at quarterback. In one of his least productive games of the season, Jackson caught 2 of 4 targets for 32 yards. Sports Day Tampa Bay podcast: Jameis Winston has bulked up. Is that a good thing? Plus, the Rays have one roster spot remaining. And, the Lightning gears up for the playoffs.